A 100-strong delegation of the World Jewish Congress (WJC), including leaders of Jewish communities from around the world, will be in Kyiv next week to take in commemorations on the 75th anniversary of the slaughter of more than 33,000 Jews by Nazi Germany at the Babi Yar ravine on 29/30 September 1941. The WJC is cooperating with the Ukrainian government, the Canada-based NGO Ukrainian Jewish Encounter, and the Jewish community of Ukraine to organize a series of events. WJC President Ronald S. Lauder will deliver one of the addresses at the official ceremony at Babi Yar on 29 September 2016. The other speakers will be Ukraine’s President Petro Poroshenko and Israel’s President Reuven Rivlin. Germany’s President Joachim Gauck and a number of other high-ranking international delegations will also be present on this occasion. Other WJC events include a commemorative dinner hosted by Ronald S. Lauder on Wednesday, 28 September 2016, and a panel discussion of leading Holocaust scholars and Poland’s former Foreign Minister Adam Daniel Rotfeld, who as a child survived the Holocaust hidden in a Ukrainian monastery. This event will be organized by the Israel Council on Foreign Relations, which operates under the auspices of the WJC, on Thursday, 29 September. The WJC is organizing these events in cooperation with the Jewish Confederation of Ukraine, the Vaad of Ukraine and the Ukrainian Jewish Encounter. 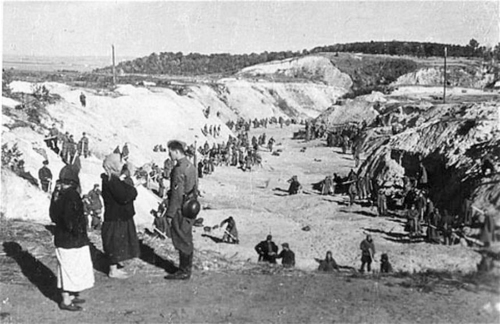 Babi Yar in Ukraine is a major symbol of the Holocaust. After conquering and occupying Kyiv in September 1941, the Germans, in particular the SS Einsatzgruppen and the 6th Army of the Wehrmacht, aided by local collaborators, set up to kill the 50,000 Jews in Kyiv who had not fled the city before it fell. On 28 September 1941, the Germans posted orders across Kyiv obliging the city’s Jews to present themselves the following day with documents, money and valuables. Instead of being evacuated, as the announcement had suggested, the nearly 34,000 Jews who turned up the next day were led to the ravine and shot dead. According to an SS report, at least 33,771 Jews were murdered at the site in less than 36 hours. Very few survived the massacre.